Now the name of a dock on Bankside (pictured below), St Mary Overie (also spelt as Overy) also forms part of the formal name of Southwark Cathedral, more properly known as The Cathedral and Collegiate Church of St Saviour and St Mary Overie. The simple version of the name’s origins is that it simply means St Mary “over the river” (that is, St Mary on the south side of the Thames) which was used in relation to a priory founded there in the Norman era by two knights (it’s to this foundation that what is now Southwark Cathedral owes its origins, something we’ll take a more detailed look at the nunnery in an upcoming Lost London post). But there’s also another, more romantic version, of the name’s origins. That story, as it’s told on a plaque located at the dock (pictured above), goes back to before the Norman founding of priory, back to the days when, before the building of London Bridge, a ferry ran between the two banks of the River Thames. The man responsible for the ferry was John Overs, a “notorious miser”, who decided to save money by feigning his death and thus plunging his household into mourning, saving that day’s provisions. As one may imagine, however, Overs was not a popular man and his servants, instead of fasting in their mourning, held a feast in celebration of his death. In rage, the old master leapt out of his bed and a servant, terrified and imaging some sort of demonic manifestation, struck him fatally with an oar on the head. Overs’ daughter, Mary, sent for her lover so that he may come and together with her claim her father’s inheritance but such was his haste, he fell from his horse and broke his neck. So overcome was Mary by her misfortunes that she founded a convent into which she subsequently retired (this was subsequently ‘refounded’ by the two Norman knights). 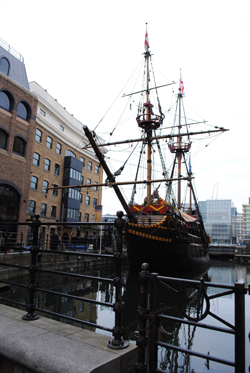 The dock, meanwhile, is today the berthing place of the Golden Hinde II, a sea-worthy replica of the flagship in which Elizabethan explorer Sir Francis Drake circumnavigated the globe (for more on the ship, see our earlier post here).